While much of Western Yoga teaching focuses on the physical poses or asana, Yoga encompasses much more. The Eight limbs of Yoga (Ashtanga) delineated by Patanjali include the Yamas (social observances), Niyamas (personal conduct), Asana (physical poses), Pranayama (breath control), Pratyahara (Withdrawal of the senses), Dhyana (Concentration), Dharana (Meditation) and Samadhi (Total Absorption). 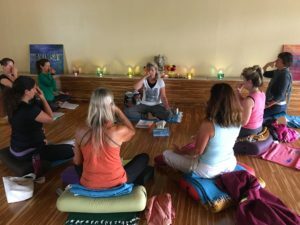 Sherry teaches basic Pranayama practices to calming balance the mind and to prepare for Meditation. The breath connects body and mind, and by slowly learning to expend and direct the breath, we can move the subtle force of the the breath within the breath, clearing our channels for the movement of energy itself. By intentionally calming the breath, the mind naturally rests and clears.